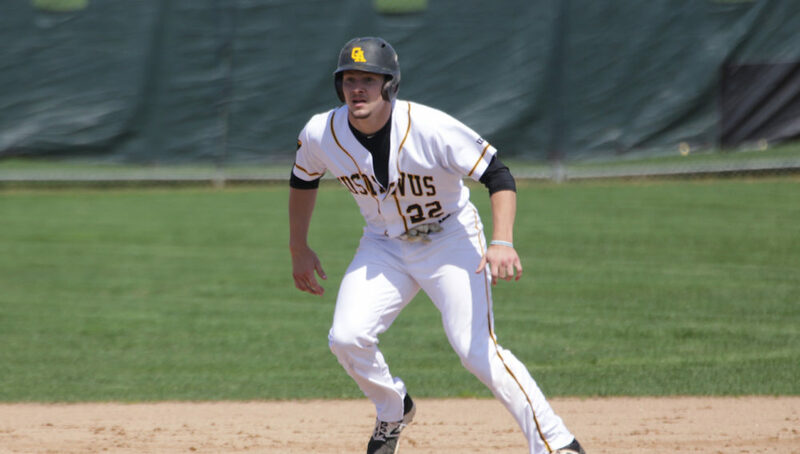 PLEASANT HILL, Iowa – The Gustavus baseball team was swept by Luther College on Sunday afternoon, falling 12-0 and 10-5 while moving its overall record to 5-6 on the season. Casey Lewandoski (Sr., Fairbanks, Alaska) earned his second start of the season for the Gusties top open the action on Sunday and allowed the Norse to five runs across, as the score stood at 5-0 after the inning. Torben Urdahl (Fy., Chanhassen, Minn.) came in to relieve Lewandoski in the second, but Luther’s offense continued to add the runs, gaining an 8-0 lead after three innings. Gustavus bats were quiet while the Norse added another two in the fifth inning and plated another pair in the seventh to seal the 12-0. The Black and Gold was able to put together its first run of the day in the third inning with a Carter Clemensen (Fy., Cologne, Minn.) sacrifice fly, but Luther answered and tied the game at 1-1 in the bottom half prior to tacking on another to claim a 2-1 advantage midway through the fourth inning. A Matt Berkner (Jr., Sleepy Eye, Minn.) run batted in tied the game at 2-2 in the fourth, followed by a John Lundquist (Sr., Rochester, Minn.) double to tie the game at 3-3 in the fifth. However, Luther broke open the game with four runs in the sixth, gaining a 7-3 lead and eventually taking the game and sweep at 10-5. Next weekend, the Gusties open play at the newly renovated Gustie Baseball Field versus Mount Marty College. A single game is schedule for a 1 p.m. start on Saturday, followed by a doubleheader on Sunday with a 1 p.m. start.